This past week has seen my skin throwing a full on fit. It might as well be a toddler having a tantrum, because it is being stubborn, annoying and not listening to reason (by which I of course mean it's not working well with my regular skincare routine). There are a few factors affecting my misbehaving skin - the first, of course, is this frigid, dry winter weather. During the cold months, my usually normal skin becomes as dry as a desert, leaving behind dry, cracked skin that even the most emollient of moisturizers can't seem to fully help. It's as if the winter blues are running through my veins and coming out in the form of irritated skin. The second factor is completely my own fault. I started experimenting with natural oils and, after a successful run with Avocado Oil, I tried out the very popular Sweet Almond Oil. While SAO might work for some, it left my skin red, raw and sensitive to even the slightest touch. It would seem I have some sort of allergy to it, judging by the hives it's left me with. Anyways, all of that aside, my crazy skin has left me going back to the basics (and it's also the reason for my unexplained hiatus - sorry, guys!). This week has seen me using only the most gentle, basic products on my face and, luckily, it seems to be calming down a bit. I've been forgoing makeup in lieu of a emollient, moisturizing cream, favoring my Embryollise Lait-Creme Concentrate during the daytime. This cream is rich and super moisturizing but also pretty fast absorbing. While it might be too rich for some skin types it has been perfect for my currently raw, red skin and has significantly helped with soothing my skin. 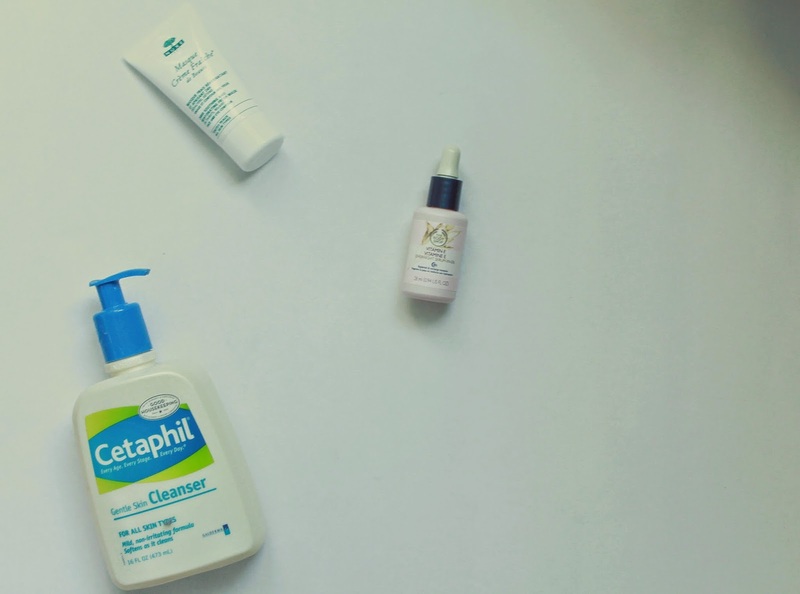 At night, I've been using one of my drugstore favorites, the Cetaphil Gentle Cleanser. I know people who swear by this stuff, and I can see why. Not only is it incredibly affordable for a generous amount of product but it's also perfect for sensitive skin. It might not have all the bells and whistles of many high end cleansers, but as far as cleaning your skin and getting makeup off I find that it gets the job done without causing any irritation. Before bed, I've been applying my Body Shop Vitamin E Serum-in-Oil. This is a product I've had for quite some time, but I've never really noticed how amazing it is until recently. The oil sinks right into my skin, completely drinking up the moisture and leaving me with healthier, plumper skin. I wake up with far less redness on my face and my skin feeling far less sensitive. It's truly been an over night lifesaver. Finally, in lieu of my normal weekly cleansing/exfoliating face mask routine, I've been choosing a far more basic, hydrating formula. On Sunday night I slathered on the Nuxe Masque Creme Fraiche de Beaute, a super hydrating cream that you can put on and then leave over night, if you so choose. It's really gentle and my skin just drinks it up. It doesn't leave my pores clogged, but instead leaves me with far healthier looking skin. It can even be used around the eye contour area, hydrating my very dry under eyes. I'm hoping that my skin will start behaving sometime soon and that I'll be able to go back to my regularly programmed skin routine (minus the SAO, mind you), but it's nice to know in the mean time that there are some nice, gentle options just within reach.